Chapter Five in the Strange Aeons Adventure Path Gets Custom Sound Suite for the Syrinscape App. 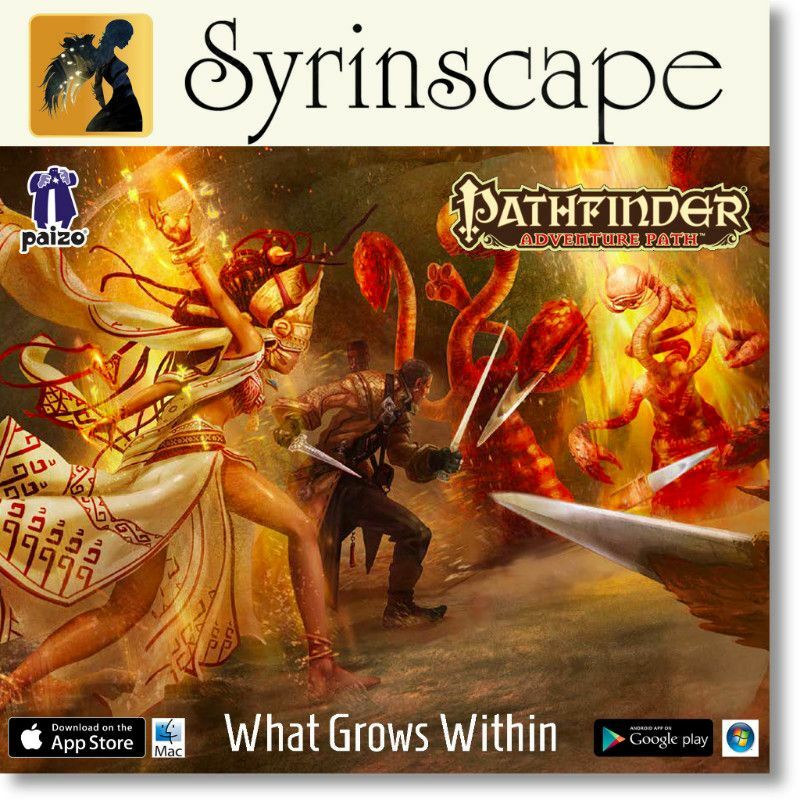 Grows Within, the 5th SoundPack chapter for the Strange Aeons Adventure Path, custom-created for the Syrinscape app to accompany the Pathfinder Roleplaying Game. The What Grows Within SoundPack has already been unlocked for Syrinscape subscribers, or can be purchased separately on Syrinscape. The What Grows Within SoundPack features all of the sounds gamers need to immerse themselves in the adventure at the push of a button. As adventurers mount an expedition into the vast and deadly desert region, they must track their treacherous former employer, recover a vile tome, activate the city’s Star Stelae, perform a powerful ritual and take care not to wake the Great Old One. Included with the What Grows Within SoundPack are a haunted cityscape, a swarm encounter, an epic battle with a juggernaut, an anti-gravity room with reverse heartbeat, flying polyps, massive caves, a Naga, a Devourer, a black-winged Hunting Horror, Ash Giants and much more. 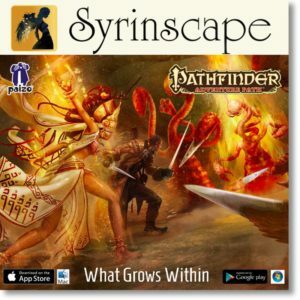 Syrinscape’s Fantasy Player, Sci-Fi Player and Board Game Player apps are free to download, come with free SoundSets and are compatible with nearly any mobile device or computer. Syrinscape can also be completely unlocked for free for 30 days at Syrinscape.com/freetrial. For $10 a month, SuperSyrin Subscribers gain full access to Syrinscape’s library, permanent ownership of new sounds released while subscribing, access to Syrinscape’s SoundSet Creator and Syrinscape Online Play tools and more.